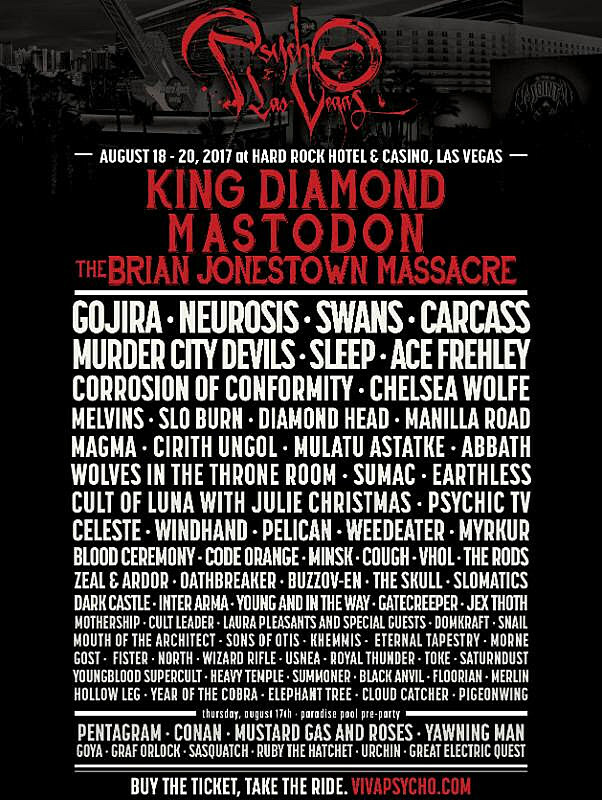 The day-by-day lineups have been announced for the stacked 2017 Psycho Las Vegas festival, and single-day tickets are on sale today. The Thursday pre-party (8/17) has Pentagram, Conan, Graf Orlock, Ruby the Hatchet, and more. Friday (8/18) has The Brian Jonestown Massacre, Chelsea Wolfe, Khemmis, Magma, Melvins, Pelican, Sleep, Sumac, Wolves in the Throne Room, and more. Saturday (8/19) has King Diamond (playing Abigail), Neurosis, Ace Frehley, Blood Ceremony, Carcass, Cough, Cult Leader, Diamond Head, Gojira, Inter Arma, Jex Thoth, Weedeater, and more. Sunday (8/19) has Abbath, Mastodon, Murder City Devils, Swans, Warning, Corrosion of Conformity, Code Orange, Cult of Luna, Manilla Road, Gatecreeper, North, Windhand, Zeal & Ardor, and more.